And yet the Japanese love devouring them. The Puffer fish is considered the second deadliest vertebrate in the world, after the Golden Poison Frog. The common image we have of this creature is that it inflates when threatened. I had a pet Fugu a few years ago but it didn't inflate at all. It died four hours after the transaction. 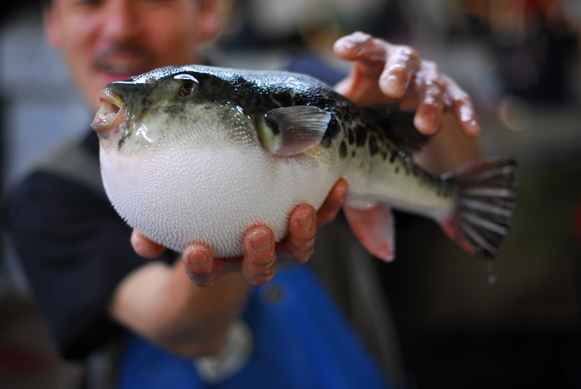 What makes Fugu so popular is the lethal toxin in its liver, skin and the ovaries, and the fact that the Japanese treat it as a delicacy. Pretty ironic I guess? By the way it is extremely expensive and prepared only by trained, licensed chefs who, like all humans, occasionally make mistakes =P. Almost all pufferfish contain tetrodotoxin, a substance that makes them foul tasting and often lethal to fish. To humans, tetrodotoxin is deadly, up to 1,200 times more poisonous than cyanide. The toxin paralyzes the muscles, including the muscles in our diaphragm, which is essential for breathing. The victim eventually dies of asphyxiation. There is enough toxin in one pufferfish to kill 30 adult humans, and there is no known antidote. Negative aspects aside, Puffer Fish makes cute companion. 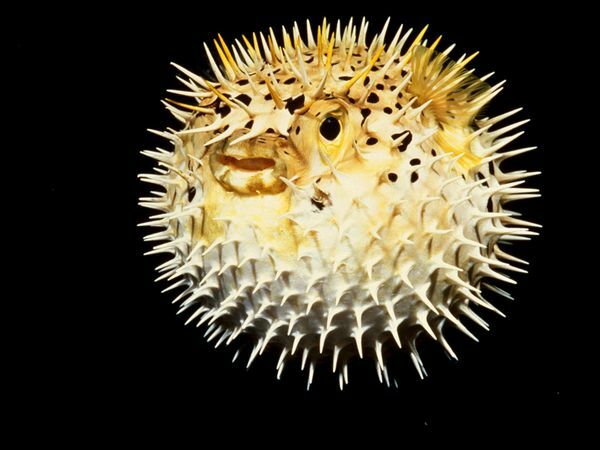 Of course, don't go around scaring puffer fish because a puffer fish could only perform a limited number of inflation in its life. When a Puffer fish is threatened, it will pump itself up by taking 35 gulps or so in the course of 14 seconds. Each gulp draws in a big load of water thanks to some peculiar anatomic changes in the muscles and bones. 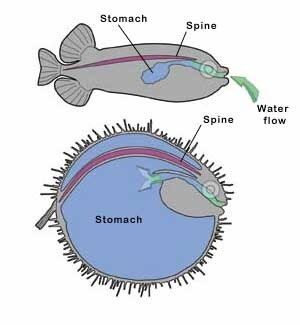 The entire fish balloons as it continuously takes water into its stomach. Image: Sally J. Bensusen. American Museum of Natural History. Sometimes they have difficulties expelling water from their stomach, and hence they actually risk dying every time they inflate. I guess we should record a default video showing one individual inflating itself on a public website to prevent curious divers/swimmers/fishers going around harming more Puffer fish.